Asphalt, concrete surface, even on compacted, clean, dry gravel. The asphalt must have a slope of 0,7-1% and must dry for at least 30 days so all solvents from the asphalt evaporate and the concrete surface must be must dry at least for 40 days with a slope of 0,7-1%. 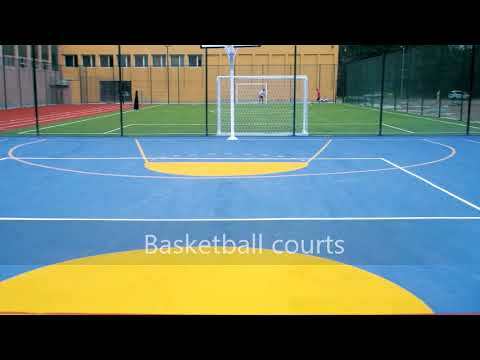 Elastic, safety wet-pour flooring ideal for children playgrounds in thickness from 4cm up to 15cm. Can be also used as first wet-pour layer of 6-15mm for volleyball, handball, basketball, football courts and multipurpose courts, with the parallel use of paver machine. Consists of a mixture of RECYCLED RUBBER 858 (80% by weight) with colored PU BINDER 1120 (20% by weight) applied by trowel with the parallel use of a cylinder (10kg). It can create many designs and patterns since the binder is produced in four colors, red, green, yellow and blue, with the parallel use of special PU UV-resistant paint POLYSPORT 1052 in 2 cross layers by airless spray. The mixture of RECYCLED RUBBER 858 with colored PU BINDER 1120 is applied in thickness of 40mm till 150mm and can be colored in all the thickness or alternatively, in the last 10mm minimum top thickness of the system. In both cases, the top coat is the special PU UV-resistant paint POLYSPORT 1052. Certified system by LABOSPORT Institute. 1. PU PRIMER 870 – Special, polyurethane primer. Apllied by brush. 2. Mixture of RECYCLED RUBBER 858, PU BINDER 1120. Applied by flat metal trowel after spreading and leveling with rake and straightedge.Rolling with cylinder follows for compacting. 3. POLYSPORT 1052 – PU, UV-resistant top coat. Sprayed on the surface in the desired color as a double UV protection of the color on the surface, to create different designs and patterns and last for many years. 2. Mixture of RECYCLED RUBBER 858 plus colored PU BINDER 1120. Applied by paver machine in total thickness of 10mm.